Metal stamping presses are designed to provide (2) things: Repeatable Force or Tonnage to do the work and a Perfectly Square Environment for the tool to be installed. Without these (2) conditions present, the metal stamping process becomes very difficult to complete properly. According to JIC Standards the maximum out of parallel between the slide and the top of the bolster plate should be .001” per foot of span, both in the left to right and front to rear orientation. Example: If you press bed is 144” left to right and 60” front to rear then the allowable out of tolerance as it relates to parallelism between the slide and bolster will be .012” left to right and .005” front to rear. Often when checking parallelism between the bolster plant and face of the slide the measurements are taken on the four corners of the slide. However, you may want to consider the approach featured below. 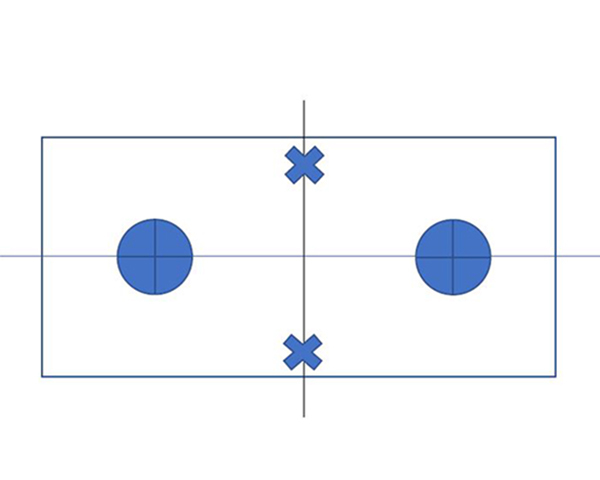 Take your measurements directly under the center of the connection assemblies represented by the blue circles to the top of the bolster plate. Now take the same measurements from the face of the slide at the X points to the top of the bolster plate. When you have a (2) two-point press and the left to right level slide has been adjusted parallel under the (2) connection assemblies. The only other adjustment that can performed is rotating the slide to a level point front to rear and readjusting the gibbing. Maintaining a parallel condition is one of the most important things you can do to insure optimum press operation. One additional important point; when parallelism checks and adjustments are made the counter-balance pressure should be on. We discuss The Counterbalance System in next month’s Press Tips. Until then, if you have questions, please don’t hesitate to call me.